You will start with a small number of repetitions and then they will increase regularly. Make sure you rest from doing squats to give your muscles time for recovery. This program is perfect for beginners who will be able to see the first results after only 30 days. No more excuses and laziness. You should start this challenge right now to test your willpower and perseverance. You can do it! Day 1 - 50 squats. Day 2 - 55 squats. Day 3 - 60 squats. Day 4 - rest day. Day 5 - 70 squats. Day 6 - 75 squats. Day 7 - 80 squats. Day 8 - rest day. Day 9 - 100 squats. Day 10 - 105 squats. Day 11 - 110 squats. Day 12 - rest day. 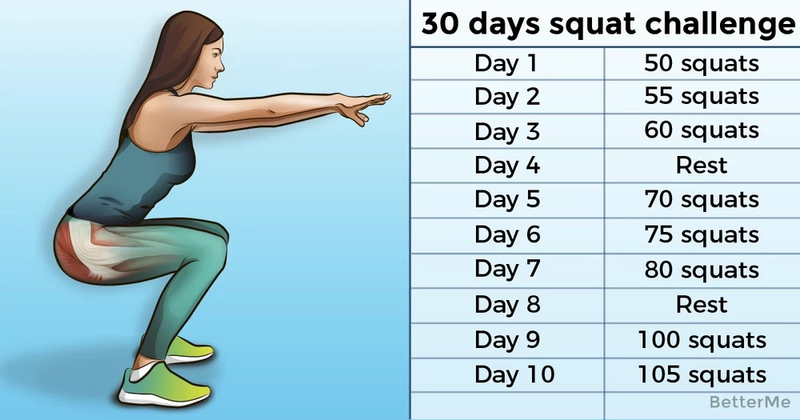 Day 13 - 130 squats. Day 14 - 135 squats. Day 15 - 140 squats. Day 16 - rest day. Day 17 - 150 squats. Day 18 - 155 squats. Day 19 - 160 squats. Day 20 - rest day. Day 21 - 180 squats. Day 22 - 185 squats. Day 23 - 190 squats. Day 24 - rest day. Day 25 - 220 squats. Day 26 - 225 squats. Day 27 - 230 squats. Day 28 - rest day. Day 29 - 240 squats. Day 30 - 250 squats.